After more than 8,000 liposuction procedures since 1982, Dr. Rhoda Narins has developed an exciting new technique for sculpting an hour-glass figure. She can flatten your abdomen while sculpting the waist, lower back, and hip areas resulting in a shapelier, more attractive figure that will fit in smaller skirts and pants. 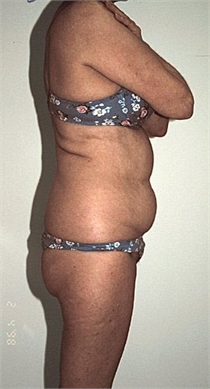 Women often develop square waists and excess fat on the back and hips. The causes for this include childbirth, menopause, or just genetics. The Hour-Glass Abdomen liposuction procedure is the perfect solution for resolving this problem. Dr. Narins uses the tumescent technique of liposuction using local anesthesia alone, to reshape the entire mid-section of the torso. Often it is not enough to just remove fat from the abdomen because the waist, back, and hips still retain their bulk which increase waist size. When all areas are treated at once, a new sexier figure emerges immediately. Patients are usually amazed and ecstatic with the hour-glass shape that results overnight. Reducing the appearance of love handles that extend around the back and the lower abdomen produces a wonderful contour improvement in men. These are the areas, along with the upper neck and chest, that men usually consult us about. For many men, the improvement is amazing and long-lasting. The number of men seen in our office has increased dramatically. More men are undergoing liposuction surgery, BOTOX® Cosmetic injections, hair transplants, laser peels, and blepharoplasty. Baby-boomers know that when you look better, you feel better and compete better in today's market. We can happily provide you with more information and testimonials regarding the Hour-Glass Abdomen liposuction procedure. Dr. Rhoda Narins has improved the appearance of many women and men from all over the world, as well as Westchester County, Manhattan, and other parts of New York City through liposuction, wrinkle treatments, and various laser skin treatments. Call (212) 288-9910 (Manhattan) or (914) 684-1000 (White Plains) to schedule an appointment and learn more.